This, the first warship of the Thirteen American Colonies named Boston, was a gundalow built in 1776 for Benedict Arnold's Lake Champlain Fleet. She served in one of the first battles of the American War of Independence, the Battle of Valcour Island. Her career was short, lasting from August to October of 1776, as shortly after the battle, cornered by the British along with the remaining fleet, she was destroyed along with the other ships by General Benedict Arnold (of diverse fame) in Buttonmold Bay to prevent capture by the British. Gundalows, perhaps due to the limited time available, were relatively primative battleships; basically flat bottom cargo vessels topped with cannons. They were built and used by both American colonists and the British during the early part of the American War of Independence. In this painting by James A. 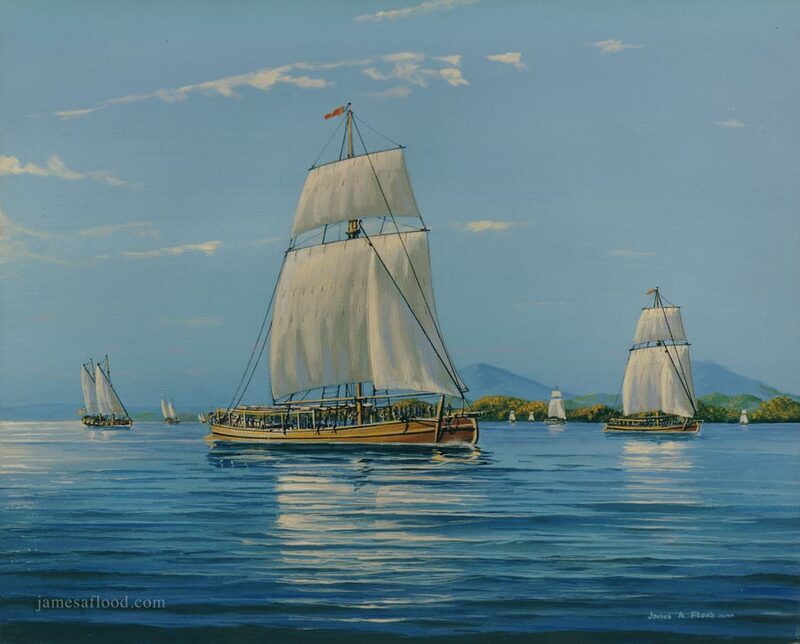 Flood, the gundalow Boston (also historically known as the first USS Boston) is depicted sailing with other vessels of the Lake Champlain squadron in late September of 1776. The squadron is headed south along the Vermont shore, with the wind on the port beam.